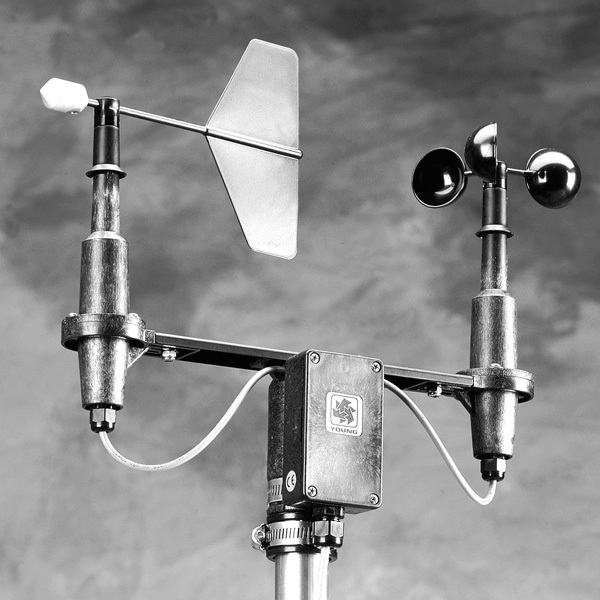 The 200-03002 Wind Sentry Anemometer and Vane are professional quality wind sensors which are suitable for a wide range of wind measurement applications. These moderately priced sensors are principally of thermoplastic construction providing excellent corrosion resistance, low sensor weight, and minimal parts count. In addition to being available as a set complete with crossarm, the sensors are also available separately with mounting brackets. The anemometer has three hemispherical molded plastic cups. Cup wheel rotation produces an AC sine wave voltage signal with frequency directly proportional to wind speed. This AC voltage signal is induced in a coil by a two pole circular magnet mounted on the cup wheel shaft. One complete sine wave cycle is produced for each cup wheel revolution. 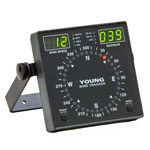 Wind vane position is transmitted by a 10k ohm precision conductive plastic potentiometer which requires a regulated excitation voltage. With a constant voltage applied to the potentiometer, the output signal is an analog voltage directly proportional to azimuth angle. The plastic vane is molded directly on the anodized aluminum vane shaft. Strain reliefs with seals are provided for cable entry to the sensors and termination junction box. Azimuth: Analog DC voltage from conductive plastic potentiometer - resistance 10k, linearity 0.5%, life expectancy 20 million revolutions.